Fascinating. Intriguing. Mysterious. Captivating. These are words that crossed my mind after watching this quirky SF. 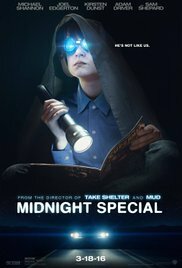 “Midnight Special” seemed to be nothing special. But at the same time it contains something special. The atmosphere of secrecy that is noticeably present from the beginning, creates an intensely long trip full of mystery and intrigue. That underlying tension will resonate for a long time until the final offensive deploys and all questions are being answered. But believe me, most of the time you’ll be sitting perplexed in front of your screen, while wondering what the hell is going on. The strength of the film is the way in which they reveal as little as possible. The story unfolds itself painfully slow. Roy (Michael “The Iceman” Shannon) and Lucas (Joel “Exodus: Gods and Kings” Edgerton) behave like thieves in the night while they drag the young boy Alton (Jaeden Lieberher) from motel to motel. Apparently this is a kidnapping, as said on all the news channels. However, when you see how relaxed Alton undergoes all of this, it doesn’t look like a kidnapping. And certainly not as Roy appears to be the father of this strange boy, who’s reading his comics with a flashlight under his sheets and who’s wearing goggles constantly. The fact that the motel room is made completely sealed of from light by means of cardboard, will make you scratch your head for the first time already. Clearly those two adult guys would do anything to protect Alton and make sure he doesn’t fall into the hands of those who are following them. Seems like a whole group of people are interested in the boy. First, there’s a religious sect. They’ve constructed an entire religion around the boy with his special gifts. He’s a kind of savior for them who’d be handy during a future apocalypse. The FBI is also looking for Alton and deports the entire sect to a secluded sporthall to interrogate them about him. Even the NSA sends an expert (Adam “Kylo Ren” Driver) because apparently the prophecies of Alton, which were used for sermons used by the cult leader (Sam Shepard), contain top secret government information. So you have a lot of enigmatic narratives that coalesce in an ingenious way into a combined endpoint. The positive side of “Midnight Special” is its purity. SF without too many glitzy technological marvels. A mix of sentimentality and no-nonsense fiction. Roy’s willingness to sacrifice himself for his son feels genuine. Roy and Luke are much like those apostles who were hanging out with Jezus. An irrefutable belief in Alton and a total submission to achieve a greater goal. The first part is also a display of the self-sacrifice and perseverance during their flight. Some magnificent acting and a touching father-son relationship. There’s a limited use of CGI. The characters of the key figures tell the story. I wouldn’t call it low budget entirely. Especially when seeing some well-known actors show up like Bill Camp, Paul Sparks and Kirsten Dunst. The end was a bit of a letdown. 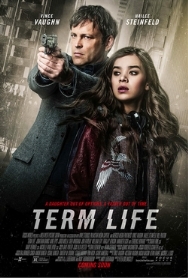 The quirky feeling of the movie is a bit ruined by the less successful “Tomorrowland“-like denouement. The peerless content and intriguing mystery that was created patiently, was instantly reduced to something superficial. A meaningless slip-up. All in all this was a whopper of a sciencefiction that’ll be difficult to surpass. And certainly one that I’ll rewatch someday.